On September 24, 2014, the inaugural #JUSTICE4DC Giving Circle composed of 17 members raised $3100 from 137 donors to fund four social justice organizations with gifts ranging from $600 – $1,000. Thursday Network – Greater Washington Urban League Young Professionals received $900 in funding to host four community assembly events in Washington, DC (2 events), Prince George’s County ( 1 event) and Montgomery County (1 event). The events brought together community leaders and neighborhood citizens to discuss police role in keeping communities safe. Know Your Right Cards were also printed and distributed during these events and other community events that enabled DC and suburban Maryland communities to know their rights when stopped by law enforcement. TN Staff - Thursday Network aimed to create dialogues within communities in the greater Washington metropolitan area. A large piece of this was expanding past Washington, DC and making sure that suburban Maryland was included. 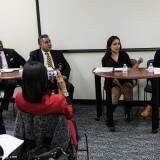 Our December 2014 and February 2014 town hall events were held in Montgomery County and Prince George’s County, MD, a large part of supporting that goal. We now have a stronger relationship with the ACLU of Maryland to include legislative action in the action plan. Over 75 community members were engaged in the Community Action Assembly events.The other target group, in addition to these distinct communities is youth. The printed information piece of this project is aimed at this group. Distribution starts with Thursday Network’s youth mentoring program, the Empowerment Academy and will also be shared with local school partners, with an expected impact of 1,000 individual students.These events were shared in a meeting with DC Police Chief Cathy Lanier, Greater Washington Urban League leadership, including Thursday Network’s president, and they will provide high-ranking support for the next DC town hall. ===} CLICK HERE to view the full grant report. ===} CLICK HERE to view the grant report photos. Robert Bland, Adrianne Burke, Matthew Evans, Saranah Holmes, Christian Howard, Kristina Jacobs, Alencia Johnson, Tara Mancini, Javier Martinez, Dexter Mccoy, Marcus Mitchell, Cadene Russell, Tisa Silver, Joseph Thomas, Daya Washington, Conrad Woody. Inaugural #JUSTICE4DC Giving Circle Members: Robert Bland, Adrianne Burke, Matthew Evans, Saranah Holmes, Christian Howard, Kristina Jacobs, Alencia Johnson, Tara Mancini, Javier Martinez, Dexter Mccoy, Marcus Mitchell, Cadene Russell, Tisa Silver, Joseph Thomas, Daya Washington, Conrad Woody. Background on #JUSTICE4DC Giving Circle: Capital Cause #JUSTICE4DC Giving Circle(www.justice4fund.org) chose two social justice organizations doing work to end police brutality and fight for social justice. Those organizations were: Thursday Network – Greater Washington Urban League and Black Swan Academy. The #JUSTICE4DC Giving Circle chose two finalists for donors to choose between for funding. Their vote was a tie, and as a result two organizations received $600 in funding. Dream Defenders and National Black United Front were the resulting grant recipients.